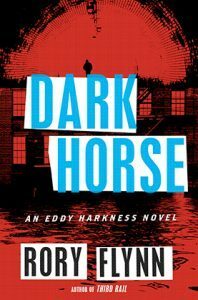 Dark Horse is the second novel in Rory Flynn’s Detective Eddy Harkness series, recounting the exploits of a hero created in the great tradition of American urban tough guy protagonists – men knocked about by life, tarnished but fearlessly dedicated to getting the job done. At the beginning of the book, Eddy is already legendary, both for tackling Boston’s criminals and for getting himself into trouble. Courageous and compassionate, he is deeply committed to the city he loves and willing when necessary to bend the rules to protect it. In the first chapters, Harkness, half drowned, battles for survival as a hurricane floods Boston. As he rides on top of a taxi that lurches through the raging water, he tenaciously keeps his hold on the deaf boy he is trying to rescue: “They thrash through the tempest, swept underwater and dragged down with the cars, trashcans, and stinking debris, the sepia water pulling at them with greedy hands. Harkness struggles toward the dim light above them…” It’s a terrific, dramatic opening, and one that foreshadows the narrative conflicts of the novel as a whole – the detective’s strength of character, his determination to help the weak, and his struggle against the vicious, submerged forces of economic and political corruption that pull at people with “greedy hands”, threatening to wreak havoc on the life of the city. Pretending to uphold Boston’s fine traditions and civic pride, these avaricious and corrupt men serve only their own financial interests. Swayed by the schemes of a man who sees himself as “an urban-planning visionary”, they are willing to betray their fellow citizens in order to tighten their control of the city. Flynn skillfully builds the tension as Harkness uncovers the hidden connections, the conspiratorial plans that will destroy the lives of ordinary Bostonians. Flynn gives his readers memorable, beautifully drawn characters and a vivid, atmospheric creation of Boston itself. Dark Horse is a tough, sharply observed novel, written with warmth and energy – a gritty, dark, suspenseful tale of a hard-boiled fight against low-life morals in the highest places.